The tooth fairy was pretty awesome. You lose a tooth and you get money. Sweet! But getting older, I've discovered something even better: the Nougat Fairy. That's what I've found in Kairu, a customer/acquaintance who recently graduated to this (even better, in my opinion) title. The first time I met her was in my store, when she came in and picked up a bacon-and-cupcake mug (good choice!). She was in a hurry as she was headed home to pack for a trip to Taiwan. The next time I saw her, she was back from her trip, and toting a big ol' sack of what she calls the best nougat from Taiwan, from Sugar & Spice, a bakery with several locations. 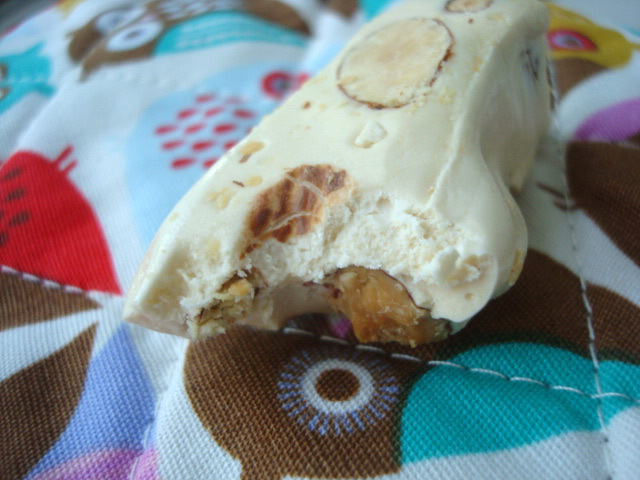 And while I can't say I have extensive experience in tasting Taiwanese nougat, I can say that this stuff is very, very good--amazingly creamy, and punctuated by crunchy, roasted nuts which act as the perfect complement to the sweetness. Addictive, even, as evidenced by said big ol' sack, which is now lamentably empty. Other offerings at Sugar & Spice can be spotty according to aforementioned Nougat Fairy Kairu and websites like A Hungry Girl's Guide to Taipei; however, this nougat is highly suggested and definitely worth hoarding by the brimming bag in your luggage. Nougat from Sugar & Spice, Taiwan; online at sugar.com/tw.